One of the first members of Basement Systems, Inc. If you’re looking for excellence in craftsmanship and customer care standards, you’ve come to the right place. In business since 1980, the staff at Bowman Masonry & Waterproofing truly understands the industries we work in. We constantly strive to provide top-quality materials to fulfill your masonry needs or to ensure your basement or crawlspace is safe from water damage. As a long-time member of Basement Systems, Inc., we’ve monitored progression in industry techniques over the years and we constantly stay up-to-date to give you the best possible results. All of our technicians are fully trained and certified to complete the necessary work. Their innovative minds are always up for a challenge! As a family operated company, we enjoy meeting with our customers and always encourage open communication practices. Take a look around and see what we can do for you, or give us a call to schedule your free estimate! We have the most effective solution for wet leaky basements. Keep your basement dry all the time with a sump pump system you can always count on! Concrete stamping offers a variety of patterns and colors to create the look of hand-laid masonry, but at a more affordable price. To have a solid concrete slab, it needs to be built right from the start. We can help! We improve the health and energy efficiency of your home by insulating the crawl space. We offer a rubber concrete resurfacing technique that is sprayed over the existing concrete to create a no-slip surface. Concrete is a natural building material found on most properties, but our services go above and beyond to make sure you get the most out of your concrete. We offer traditional services like concrete pouring. We can also alter its appearance through our restamping techniques, which imitate the look of hand-laid masonry at an affordable price. And resurfacing allows us to change concrete’s functionality by giving it some grip. As masonry experts, we are more than capable of creating a new pathway or other feature on your property through brick or block laying services. We work with a variety of materials to suit your needs and tastes. If you have any questions, please do not hesitate to ask! If you’ve noticed dampness or flooding in your basement or crawl space, waterproofing is the only way to save not only utility of that one room, but also to protect the rest of your home from decay. Bowman Masonry & Waterproofing uses a series of industry-proven basement waterproofing products and techniques to restore your control over your home. We’re the contractor for you! When you choose the right contractor, all the details of your project seem to fall into place. For all your masonry or waterproofing needs, we have got you covered! Not only do we use only the industry’s best materials and services, but we also make them affordable and sensible for you. Bowman Masonry & Waterproofing is a family company, locally owned and operated, and dedicated to complete customer satisfaction. 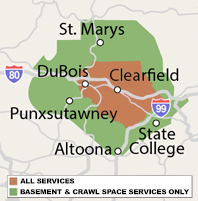 We offer our services to residents of the following cities: Altoona, State College, Bellefonte, Du Bois, Saint Marys, Tyrone, Port Matilda, Kersey, Brockway, Ridgway, Pennsylvania Furnace.